While Americans are focusing on the potential outcomes of the fall Congressional elections, there is another election going on that will have ramifications for Americans. There is a high-profile campaign happening right now in Brazil that may help determine if Central and South America will move away from the corrupt socialist policies we see being promoted in Venezuela and Cuba toward free market-oriented policies promoted by the likes of a candidate who is likely to be the next President of Brazil. This past week, Jair Bolsonaro of the Social Liberal Party (PSL) almost won the Presidential contest with 46% of the vote in Brazil, running on a conservative platform. The New York Times reported on October 7, 2018, “Brazilians will now vote in the runoff election on Oct. 28 between Mr. Bolsonaro and Fernando Haddad, the leftist Workers’ Party candidate. The two men represent radically different visions for Brazil, the world’s fourth-largest democracy, where leftists have won the presidency in every election since 2002.” This election is a bell weather on the future of politics in the Americas. Many have compared Bolsonaro with President Donald J. Trump because of his tough tone and push against the establishment dominating Brazil. Bloomberg interviewed Bolsonaro on the issues in October 17, 2017 and he promoted an overall message to rid Brazil of corruption. He said he would “consider the privatization of state companies in all sectors,” because the sales will both boost competitiveness and “nullify issues of corruption in state owned companies.” He also said he wanted to lower the borrowing costs by cutting interest rates from 8.5% to 2%. This would serve to help jumpstart the private sector and to take away a built-in competitive advantage for state run companies. Also, a trade goal is to lessen commerce with China to shift to a bigger trade relationship with the United States. All of these policies will help Brazil and the United States economies to grow. Bolsonaro has the political benefit of running against a current leadership that has demonstrably destroyed the Brazilian economy, engaged in rampant corruption and an allowed epidemic of crime to spread. Luiz Inacio “Lula” da Silva was president from 2003 to 2011 and ended up in jail for bribing politicians on behalf a big state-owned oil company in Brazil. Lula was succeeded by Dilma Rousseff who also was embroiled in the same corruption scandal and was impeached by Brazil’s legislature for her role in the scandal. Rouseff was succeeded by Michel Temer, a more moderate politician, who entered office with an abysmal popularity rating. During this time of rule for socialists, the Brazilian economy crashed, and crime spread through the nation. Brazilian voters dislike the corrupt establishment in Brasilia, the capital of Brazil, much like Americans hold Washington, D.C. in disdain. Much like the left in the United States has adopted a very aggressive form of confrontation and harassment of political opponents, the same has happened in Brazil. 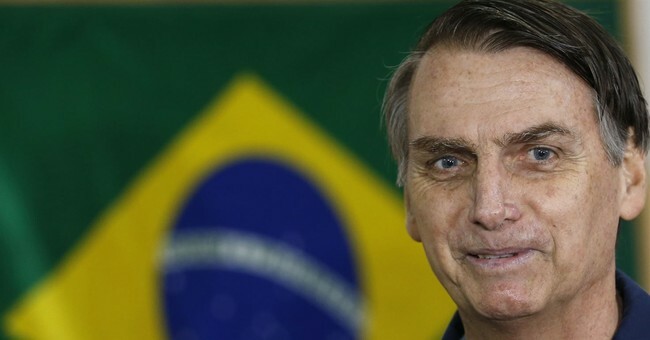 The left accuses Bolsonaro of seeking to reimpose a military dictatorship if he is elected. The left-wing fear mongering lead to an assassination attempt on the life of Bolsonaro who was stabbed at a campaign event that almost took his life. It seems that Brazilian voters are more scared of returning to the corrupt policies that have destroyed the Brazilian economy than believing the disinformation coming from a party spawned by Marxists. Much like the U.S., Brazilian voters are motivated by economic issues. According to The Heritage Foundation’s Index of Economic Freedom, “Brazil’s economic freedom score is 51.4, making its economy the 153rd freest in the 2018 Index. Its overall score has decreased by 1.5 points, with a steep drop in fiscal health and declines in labor freedom, business freedom, government spending, and government integrity overwhelming improvements in judicial effectiveness and property rights. Brazil is ranked 27th among 32 countries in the Americas region, and its overall score is below the regional and world averages.” Bolsonaro would change that status quo to bring Brazil away from the bottom of the rankings and into the zone including the United States and Canada. With a sputtering economy and corruption in the ranks of government, crime has become one of the biggest issues in the campaign. James M. Roberts of The Heritage Foundation wrote in a piece titled "Will Jair Bolsonaro Make Brazil Great Again?" that “Brazil is on track to exceed the record 63,000+ murders recorded last year. Martial law has been imposed in Rio de Janeiro to contain its notoriously lethal gangs. Mr. Bolsonaro promises tougher law enforcement — and allowing ordinary citizens to arm themselves.” Brazilian voters want some law and order imposed on a nation where the police can become the biggest threat to the people. While U.S. voters obsess over whether Democrats will take over the U.S. House of Representatives, let’s keep an eye on Brazil’s elections and hope that someday a President Jair Bolsonaro can take Brazil closer to the United States and reform an economy that is a case study in why socialism leads to corruption and stagnation.